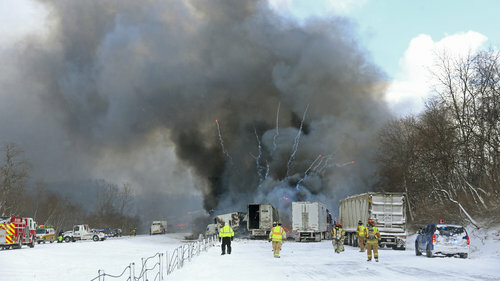 NPR reported on a pileup involving 123 cars and trucks, several hauling hazmat, which resulted in one fatality, 23 people injured, fire and explosions. Driver Ryan Bovee, who was involved in what seems to have been one of the first collisions, said the trouble began around 9:15 this morning, just after he realized that most of the road was coated by ice. Not long afterward, a van hit the rear of his car, and he hit the car in front of him. The number one job of a driver is to maintain control and to focus on driving the vehicle. Continue to drive the vehicle. It’s natural to want to slow down and regain control of the situation. Hitting the brakes hard can pitch your vehicle forward, resulting in a skid and loss of control. Brake gently, if you need to brake at all. On roads that are partially covered by ice, ABS can help the driver stop and steer the vehicle more effectively, provided he keeps the brake pedal depressed, and does not pump the brakes. Under severe conditions when the entire road is covered with ice, all four wheels may lock simultaneously. Unless at least one wheel is turning, the ABS will react as if the vehicle has stopped. When this occurs, the ABS is defeated, and the driver will need to go back to the pumping technique. With ABS — don’t pump the brakes — but if all four wheels lock up, the vehicle could still go into a skid, so unlock the wheels by momentarily releasing the brake pedal. How would know if all of the wheels are locked-up? Your vehicle will start to skid. A skid occurs when at least one wheel is locked up, or from uneven tire rotation (due to tires that are spinning, or from hydroplaning on slush, wet snow, or water). ABS prevents skids by keeping the wheels from locking up. Federal Motor Vehicle Safety Standard No. 121, Air Brake Systems, mandates antilock braking systems on air-braked vehicles with a GVWR of 10,000 pounds or greater. ABS is required on tractors manufactured on or after March 1, 1997, and air-braked semitrailers and single-unit trucks manufactured on or after March 1, 1998. Among the types of crashes that ABS influences, there is large reduction in jack-knives, off-road overturns, and at-fault involvements in collisions with other vehicles (except front-to-rear collisions). Counteracting are an increase in the number of involvements of hitting animals, pedestrians, or bicycles and, only in fatal crashes, rear-ending lead vehicles in two-vehicle crashes. Truck drivers need to watch the trailer when braking on ice. If the wheels lock up, a trailer can start to swing around. 3. Cut Power to the Drive Wheels: Declutch or Put the Shifter in Neutral. Suddenly taking the foot off of the fuel pedal while on ice can induce a skid. Cutting power to the wheels by putting in the clutch or, for an automatic, placing the shifter in the neutral position, is one way to maintain even tire rotation and prevent a skid. A driver should practice moving the shifter into neutral before a skid occurs so, if needed, it will be a natural move. Anticipate longer stopping distances with newer ABS equipped vehicles.